I have recently taken a London - San Francisco (12 hour) flight, with a toddler in the seat directly behind me. His parents actively encouraged the kid to speak out in that typical proto-speech, while reading out from books. For 12 hours. One might think that the industrial-strength earplugs I always carry with me would have helped. One would be very, very wrong. What specific steps can I take in all of my future flights so that this experience will never, ever repeat itself? second, try to minimize the impact of the child on you. Buy a more expensive ticket - first, business, even economy plus. Children are of course allowed in the more expensive zones, but they are in substantially fewer numbers. In some cases these children are experienced and quiet flyers, accompanying parents who have been kept awake by other people's children in the past. And do what you can to improve things at whatever seat you have. Bring noise cancelling headphones in addition to earplugs, for example. Bring some sort of music you can play that will drown out the repetitive reading. third, try to react in the moment in some way that is more positive than sitting in your seat seething. Go for a walk. Strike up a conversation elsewhere on the plane. Turn around and interact with the child, such as playing peek a boo over the back of your seat. It's probably likely to be quieter than the reading and even endear you to the parents. Tell the child your name and ask theirs, and smile. If in a few hours you want to ask the parents if there's a quieter form of entertainment available, you won't be the grumpy gus in the next row, you'll be the toddler's airplane friend. fourth, try to be realistic. No toddler does anything for 12 hours. They nap, they eat and drink, and so on. Focusing on the behavior that irritates you, to the extent you genuinely recall that it took the entire flight time, leaves you with a bad cloud around you that can take days to shake. When the noise starts, tell yourself it won't last the whole flight. Do something positive, listen to something, take yourself away from the noise. When the noise stops, be grateful, even if it's just a short respite. And finally, when you leave the plane, be grateful that you are now done with that child and don't have to hear the noise or put in any effort to try to prevent bedlam. The parents will still be on duty for hours more today, and for another few decades in general. Count your blessings! For $160,000, you can hire a private jet for London - LAX return which is a similar trip length to that of London to San Francisco. This aircraft seats 13 making the trip approximately $12,300 each if you could find 12 other people to share it with. That's a similar price to paying for fully flexible first class. For that you typically get a private terminal, minimal security, ability to take almost as much luggage as you wish, and an aircraft that will wait for you and take off whenever you want. You also guarantee to be sharing the aircraft with people of your choice. The OP specifically asks "how to avoid toddlers". This question and similar questions, such as how do I avoid drunks, people who snore or sitting next to someone with bad body odor, or why should babies be allowed in first class, typically end up with the canonical answer that you should fly in a private jet. When you are taking a form of public transport, inevitably you are going to come across a disagreeable situation or disagreeable passengers. On almost any airline (apart from, I think, one exception), babies and young children are allowed in all cabins including First and Business class. Children under a certain age are not allowed in the exit row, but they are allowed in front of, behind and in the bulkhead adjacent to the exit row. There are many parents who can afford to travel in Business and First and you see young children in these every day. Some parents prefer an overnight flight to a day flight in order to get the children to sleep more quickly. In summary, you can almost never be guaranteed to more than one seat away from a toddler. If the OP had said he'd had an uncomfortable flight and asked what's the best way with dealing with noise on an aircraft, I would have provided an answer responding to that question, rather than the question that the OP did ask. Toddlers cannot be seated in exit rows. If you are able to select your seat, choose one that has an exit row behind it. You may lose the ability to recline your seat, but you are guaranteed that there will not be a toddler behind you. Since no children can sit in the exit row and parents will want to sit next to their children, you're guaranteed to have nine child-free seats. 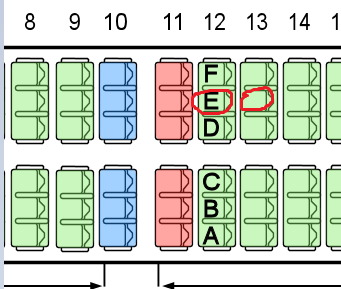 If you're flying with a large group you could go further and reserve a large block of middle seats around the exit row. A similar solution could be applied to other seat configurations. Bring $20 - $50 cash. After you board, if you happen to be near a toddler, find a more preferable seat that seems to have a solo passenger in it, and make an attractive cash offer to the person who currently has that seat to switch with you. Be upfront with your reason for wanting to switch, as they will likely be suspicious otherwise. Rather than using earplugs, get some headphones and listen to music or something. It'll give you something else to focus on rather than the toddler. This is the approach lots of computer programmers use in open-plan offices, by the way. If you're wanting to sleep, then choose classical music. The following is just speculation, but it may work: try having a book, movie, or some sort of electronic device to focus on so that you aren't just thinking of, or actively trying to avoid thinking about, the toddler. While long haul, no layover flights may seem advantageous, this is one area where a multi-hop flight has advantages. If you are seated in an inconvenient manner, you don't have to deal with it the entire flight, the next flight will provide a different seating, and even if that one is inconvenient you'll at least have a layover where you can walk away from stressful environments, perhaps in lounges that cater to your need for peace and quiet. Consider booking your next flight with multiple legs. You may avoid such problems if you travel first class. On the long term you may not be all that better off, as by the time you get used to traveling first class your tolerance of imperfections may decrease. See e.g. this review of Royal First Class travel on Thai Airways. Judging from your description it seems like your complaints are mainly noise related. You would most likely benefit from some noise canceling headphones. While there are many models out there, Bose has a pretty good reputation in this area. White noise is particularly good at "cushioning" sound so that the highs/lows as well as ambient sounds blend into the background. In fact, there are very well-reviewed machines whose sole purpose is to make white noise to help block out sound and make it easier to fall asleep. For situations like yours, though, I usually just go to iTunes and play a white noise song on loop, to help me focus and block out distracting noise, whether it be at work, home, or while traveling. My song of choice is "Ocean Waves" but there's a wide variety of white noise songs to pick from, depending on your preference. As @Bewryn suggested, you could get a private flight: If you are that desperate to get away from the public, it's a good option. Try and distract yourself - Read a book, listen to music, go for a walk if on a bigger plane. Whatever helps you. Not the answer you're looking for? Browse other questions tagged air-travel tips-and-tricks children sleeping long-haul or ask your own question.